So what good's a lathe? I don’t think he took my comment seriously but a lathe is simply not a machine that you can plonk in your shed and the next day be turning stainless steel into threaded spigots with 2 thou accuracy. It simply ain’t gonna happen like that unless you already have a background that heavily involves machine tools of this sort. However, it’s also not the sort of machine that’s useless until you have mastered its every intricacy. I’ve owned a lathe for about 2 years; in that time I have read perhaps a dozen books on using lathes and I would have spent perhaps 50 hours using it. Compared with a tradesman fitter and turner – let alone an instrument maker – I reckon I have perhaps less than 5 per cent of their lathe machine skill level. But here’s the punch-line: I already consider it to be one of the most important tools in my home workshop. Once you have a lathe, you seriously wonder how you ever did without it. 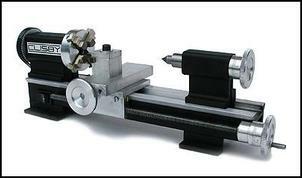 Small lathes tend to fall into two classes. Brand-new and cheaply made, or older and expensive. Yes, like other durable machine tools, it’s quite easy to pay a lot more for a lathe that’s 20 or 30 years (or more) old than it is to buy a brand-newie. But if looking at new lathes, what is suitable? 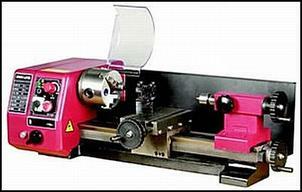 Small lathes are available at a number of outlets. There are plenty of on-line retailers (eg through eBay) that sell smallish lathes, usually minus the stand. Cost is around AUD$750. However, they’re often not particularly high quality units and plus by the time you add a four-jaw chuck, face plate, tailstock chuck and stand, the cost goes up substantially. These lathes usually have a distance between centres (ie the longest object that can be continuously machined) of 250mm and a swing (the radius of the largest cylinder that the lathe can machine) of 140mm. So they’re only small lathes – but that doesn’t mean they’re useless. In fact, in the year I have had my lathe, I doubt I have machined much that couldn’t have been done on that sized machine. Even smaller lathes are available, for example those from Clisby Miniature Machines. These Australian-made lathes use extruded aluminium beds and are tiny – just about small enough to fit in a shoe box and light to match. They use 12V motors and the power supply and motor speed control need to be provided by the purchaser. Pricing is from just AUD$350(including 3- and 4-jaw chucks, tailstock chuck and faceplate) but the lathe is sized with just 114mm between centres and a swing of 63mm. However, these lathes are not designed for machining steel – they’re primarily designed for soft materials like aluminium and plastics. Users of these lathes say that you can machine steel, but you need to take very small cuts indeed. And of course, neither of these lathes can cut screws – that is, have the ability to form threads on a rod or within a bore. On eBay and in machinery retailers you’ll also find plenty of new medium-sized lathes. They’re normally made in China and look fine. But I got some advice from an old guy at a machinery store, advice that seemed (and seems) valid. "Don’t buy any of the cheap and small new Chinese crap," he said. "We sell it here but it’s just rubbish – it’ll drive you mad." I bought my lathe – a 1940s US-made Southbend – on eBay for $510. I’ve been watching every day since and it was a good deal – normally lathes of that size go for closer to AUD$1000. But in either event, it’s the path that I suggest new lathe acquirers take. Realistically, a beginner won’t have the level of expertise to assess the condition the lathe is in (unless you take along an expert! ), but the normal tactics of buying secondhand goods (how trustworthy is the seller, do the goods look well maintained, what’s their history) will hold you in good stead. I’d be wary of buying an ex-school lathe, simply because you can be confident that every abuse ever handed out to a lathe has been gleefully done so! 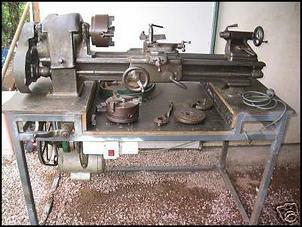 On this basis you should be able to buy a secondhand lathe for about AUD$1000. For that price it will have a feed for parallel turning (indicated by a powered screw thread that runs the length of the bed) and you’ll probably also get 3- and 4-jaw chucks, a dead centre and some tools. Don’t worry if all that’s another language: any beginners’ reference book on lathes will explain all. So you want us to spend AUD$1000 or more on an obscure machine that you say is hard to learn how to use! So what good will it be to my car modification? Perhaps taking a look at a few things I have done with my lathe will be indicative. 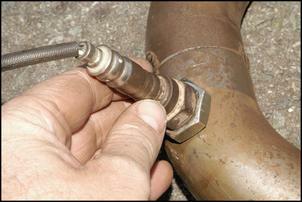 The first major job was the mounting of the wastegate actuator on a turbo. The turbo was one from a Subaru Liberty (Legacy) twin turbo B4. 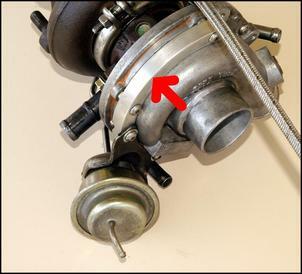 In the pictured Subaru application, the exhaust feeds comes up from below, whereas in its new application, the exhaust manifold needed to come in from above. The turbine housing was rotated to get its entrance in the right place, in turn necessitating a new mounting arrangement of the wastegate actuator - it normally bolts to cast-in bosses on the compressor cover. To provide a new mounting surface, the lathe was used to turn-up a thick aluminium ring. This was sized to be a snug fit over the compressor cover, with a section of the ring cut out to allow the compressor discharge nozzle to fit through it. The ring was held in place by longer-than-standard stainless steel cap bolts, the ones that also hold the compressor cover in place. Spacers were used to distance the ring from the compressor lugs – without these, the ring would have had to be a very complex shape to provide sufficient ‘meat’ around the bolt-holes. The wastegate actuator was then bolted to the ring. Two years later, the modification is still performing without any attention. To make the ring without a lathe would have required extremely careful use of a metal-cutting blade in a power jigsaw and then much filing to shape. Lathes can be used to turn plastics as well as metals. (In fact, plastics are often easier to work with on a lathe, being in many cases much more forgiving of poorly-ground tools, the wrong angles and the wrong feed rates!) One application for which I used the lathe was in machining a polyurethane suspension bush. ...so that the flange sat flush against the end of the mounting tube rather than sitting a little proud. Another application was in making plastic suspension bushes from scratch. Here two bushes made from High Density Polypropylene can be seen. 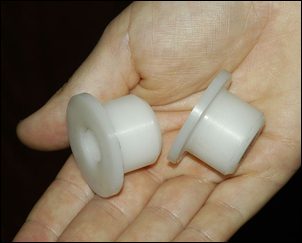 They could equally well have been made from nylon or PTFE – both the latter are widely recommended for bearing surfaces in this sort of application. Despite appearances, these bushes were easy and quick to make – say 15 minutes each. Since the polypropylene was bought as scrap for near nothing, these bushes probably cost about 10 cents each – custom sized for the exact application I had in mind. OK, so it’s not an automotive application but it just as well might have been. 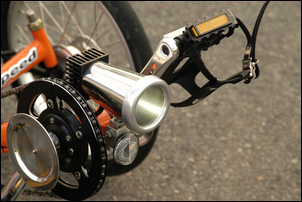 The aluminium rim being used on this pedal machine headlight was turned-up on the lathe from – wait for it – the bottom of an old aluminium fire extinguisher! The inner diameter of the fire extinguisher (75mm) already matched the outer diameter of the stainless steel drinking cup being used to form the main body of the light, so it was just a case of parting-off the bottom of the extinguisher and then using the lathe tool to cut out the centre of the base. The rolled edge was already present (to hold the pressure in the extinguisher) and so the whole job took maybe 20 minutes! Without a lathe, realistically it would have been impossible. 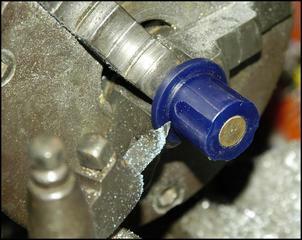 Using the lathe, this nut was shortened so that it provided the right threaded length for an oxygen sensor mount on an exhaust pipe. The modification could have been done with a hacksaw and file but it would have been extremely hard to get it looking as good as this. 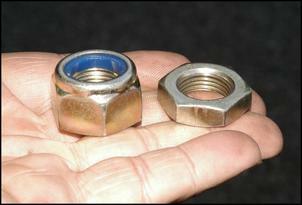 It was also used to get the length of the nut exactly right for the application. Without a lathe, drilling holes in the centre of round things is difficult. And drilling holes down the centre of long round things is bloody impossible. 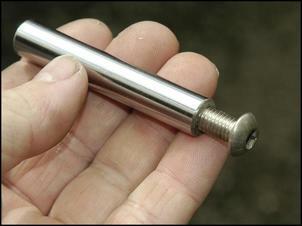 This chrome-plated steel shaft needed a hole drilled through the middle of it so that it could be tapped to take a bolt from each end. (The rod was being used as a crush-tube in a suspension bush, but equally well it could have been being used as a spacer or a support.) Without a lathe it would have been a nightmare task. 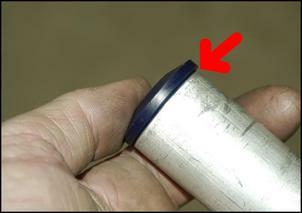 Need to cut a hole in the centre of a PVC pipe cap as part of a cold air intake system? You could try centre’ing a hole saw or – God forbid – try to cut the circle out neatly with a jigsaw, or you could simply place the cap in the lathe chuck and bring up the tool. A few seconds later and you have a perfectly concentric hole cut out of the centre. If you make things – any things! – a lathe is a tool of enormous worth.